Well, they say a way to a man's heart is through his belly and that's certainly true for Jesse - but I've got an extra little secret to winning him over. You see, if you want to win Jesse over, all you've got to do is serve him a steak. Before Jesse moved here, I'd never cooked a steak in my life. I don't eat steak and Mum always cooked the barbeques at home so I'd never had a reason to cook one - but once Jesse moved here I was thrown into the deep end and had to learn how to cook steak! These days, I cook at least one steak a week and I've perfected the art of the perfect steak - as well as the perfect accompaniments. 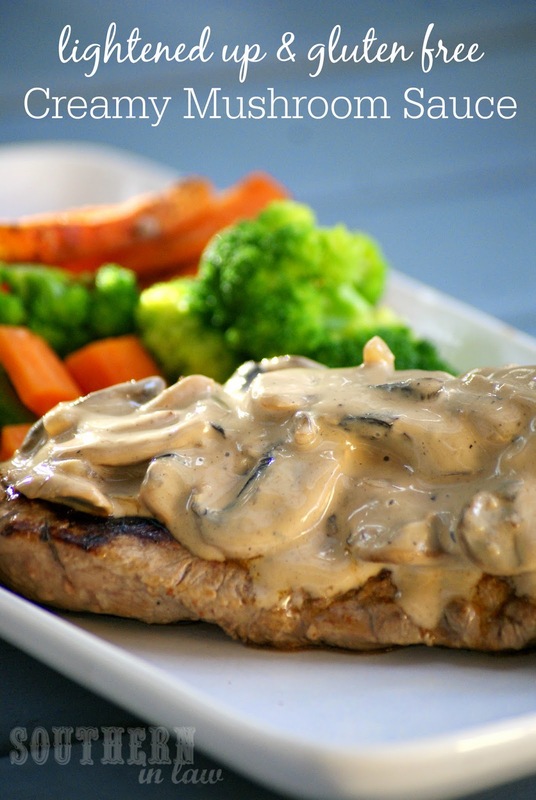 Jesse's favourite meal is a nice steak, served with "my" creamy mushroom sauce and "my" homemade sweet potato fries. That's the meal to really win him over. 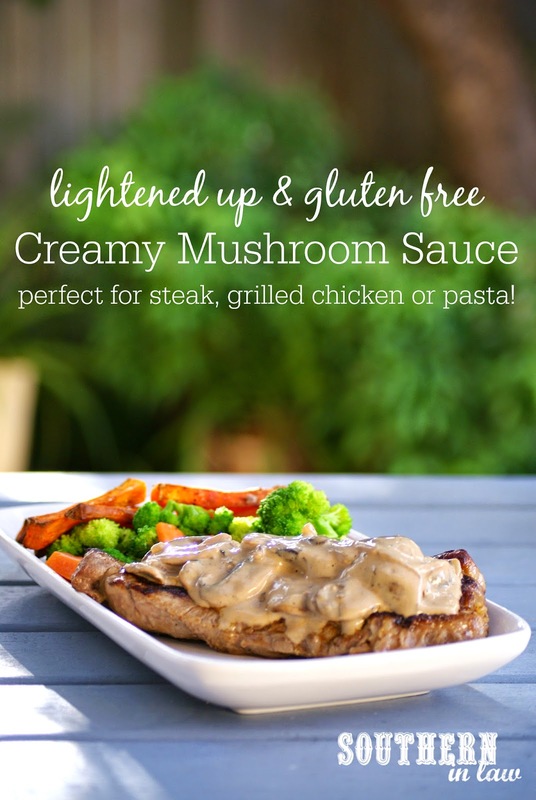 But whilst a creamy mushroom sauce may sound indulgent, in true Kristy fashion I've managed to perfect a recipe for a lightened up, healthy creamy mushroom sauce that's the perfect accompaniment for steak or grilled chicken - or just about anything you fancy! Best of all? It's super simple and you really can't mess it up and with Valentines Day fast approaching, this may just be the perfect meal for your honey too! serves 1, easily multiplied for a crowd or a couple! Optional: we often add in extra seasonings, depending on what we put on our meat - usually it's a "Season All" blend or garlic and herbs or some cajun spices if we want something different! In a small frying pan or saucepan over a medium-high heat, saute your onion and mushrooms with about a tablespoon of water until soft and caramelised. Add in your cream cheese and seasonings and reduce your heat to low. Add in as much milk or water as needed to get the perfect consistency for you and season to taste. 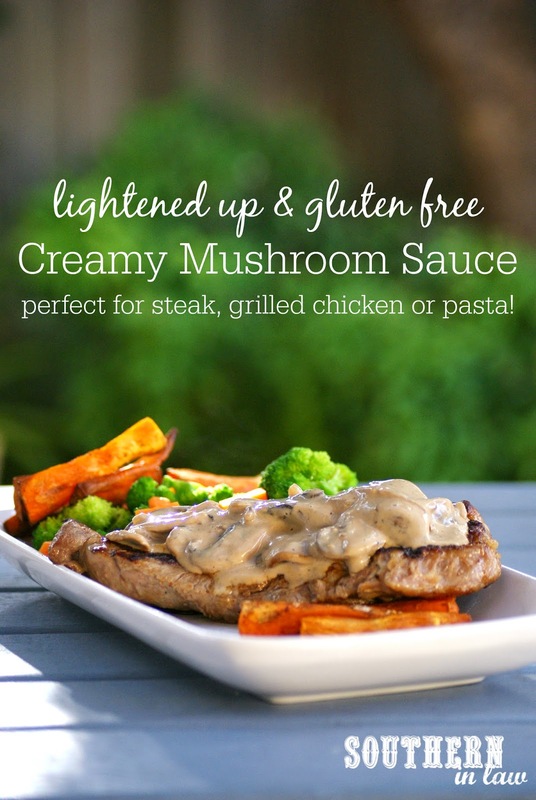 Serve over a grilled steak, a piece of grilled chicken or mix through pasta - there's so many options for this delicious sauce! You'll notice I don't use any oil or butter to saute the onion and garlic here. This is because when I first started making it, I couldn't tolerate any oils or butter (as my stomach was so sensitive due to gluten damage) so I learnt to make it without, however, you can definitely add some in if you prefer! But tell me, what's your favourite dinner meal right now? And what's one food that will always win you over? Right now I'm loving risottos and am working on a few lightened up recipes that I can't wait to share with you! As for winning me over, there's lots of different foods that could potentially win me over - but they're probably all sweet :P Jesse is definitely more of a savoury fan than me! Haha, so many foods can win me over too ;) As long as I can eat it, there isn't much I'll ever turn down or not try!